Inequality and injustice have distinctively geographical aspects in modern Ireland. 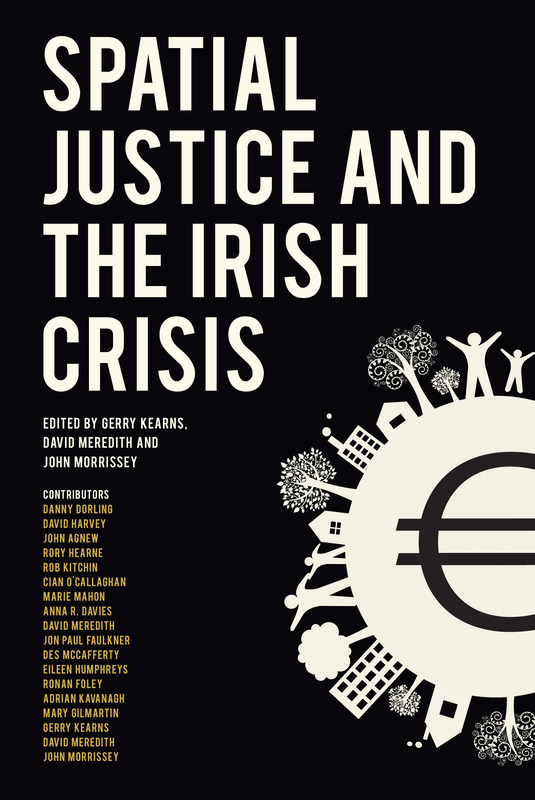 Spatial Justice and the Irish Crisis describes and explains the socially, economically and geographically differentiated outcomes of one of the most far-reaching economic calamities experienced by any developed country in the past century. You can buy the e-book here. Gerry Keanrs is a human geographer at National University of Ireland, Maynooth. He works on the cultural politics of AIDS, on the political geography of the Irish Catholic Church, and on the geopolitics of imperialism. His publications include works on medical geography, Urban epidemics and historical geography (1985), on urban geography, Urbanising Britain (ed. with Withers, 1991) and Selling places (ed. with Philo, 1993), and on the history of geographical thought, Geopolitics and empire (2009). Geopolitics and empire was awarded the Murchison Prize by the Royal Geographical Society. He is on the editorial boards of Historical Geography, Journal of Historical Geography, and Irish Geography. David Meredith is a rural and economic geographer at the Spatial Analysis Unit in Teagascâs Rural Economy Development Programme. Reflecting the complex nature of contemporary rural development, his research focuses on rural restructuring with a particular emphasis on the evolution of the economy and the implications of changing settlement patterns for rural areas. He has published on the spatial impacts of EU and national regulatory systems on rural industries (with McGinley, 2008; with Crowley and Walsh, 2009), the implications of economic change for rural communities, and strategic spatial planning in Ireland. He is currently Head of Research for the Commission for Economic Development of Rural Areas. John Morrissey is a political and cultural geographer at the National University of Ireland, Galway. He has published widely on issues of imperialism, geopolitics and development and is author of Negotiating colonialism (2003) and Key concepts in historical geography (with Nally, Strohmayer and Whelan, 2014). He previously taught at the University of Exeter and City University of New York, where he was an Irish Research Council Fellow. At NUI Galway he is Programme Director of the MA in Environment, Society and Development. In 2012 he won the Irish National Academy Award for the Integration of Research, Teaching and Learning. He is currently the Quatercentenary Fellow at Emmanuel College, Cambridge, where he is writing a geopolitical history of US Central Command.